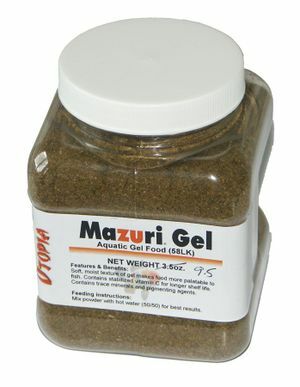 Mazuri Aquatic Gel Diet - 58LK with Krill meat and Astaxanthin. There was no date stamp on the tubs provided so it is recommended to write the purchased date on the label when you get it. This food is a high quality processed fish food which the manufacturers claim will last for 6 months in the powder form or if made into a gel and stored in a air tight container in a freezer it will last 3 months. If stored in a refrigerator it will keep for 3 days. 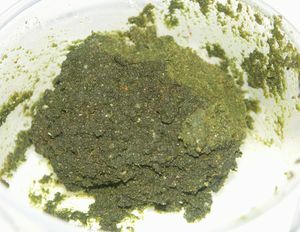 Fish Meal, fish oil, gelatin, krill meal, spirulina, betain, L-ascorbyl-2 polyphosphate (source of vitamin C), xanthan gum, choline bitartrate, pyridoxine hydrochloride, menadione dimethylpyprimidinol bisulfite (source of vitamin K). astaxanthin, biotin, calcium pantothenate, canthazanthin, inositol, cholecalciferol (vitamin D3, d-alpha tocopheryl acetate (natural source vitamin E), thiamin mononitrate, nicotinic acid, folic acid, beta carotene, vitamin A acetate, riboflavin, ethoxyquin (preservative), zinc oxide, cyancobalamin (vitamin D12), manganous oxide, ferrous carbonate, copper sulfate, zinc sulfate, calcium iodate, calcium carbonate, cobalt carbonate. The manufacturer claims that this food contains all vitamins and trace minerals known to be required by fish. Therefore vitamin supplements are not required. This food is produced by a USA company who supplies zoos and large animal organizations with high quality animal feed. As this is a high protein sinking gel food, it is especially good for young fancy goldfish (< 18 months) or young balloon fish who may otherwise suffer from digestive problems. Try the 5ML6 version which has a lower protein level for older fish. This is an excellent food for constipated goldfish and my Mollys and Corys love it too. With a 50:50 mixture the food is a solid gel and is easily cut to size and sinks like a stone whilst remaining together for well over 10 minutes in the tank. On some forums I've heard it called the best man-made fish food on the planet. I can see why. As I live in the UK, it was expensive to buy it in from the USA. So I've taken a point off.